When a ground-fault circuit interrupter, or GFI, interrupts your day by tripping, it can be a nuisance. However, by doing its job it has more than likely saved the entire electrical system from having a larger issue. When an outlet doesn't operate as it should, there can be a few reasons the GFI has paused the purr of electricity flowing through the home and into the outlet. Finding out what is causing the outlet to trip and resetting it so that it is supplying electricity safely again is a fairly easy task to complete. A little investigating and some simple solutions will get the GFI outlet back in well-working order. The GFI outlet is installed to prevent fire hazards or electrical shocks from wiring that is damaged, overloaded or otherwise compromised. They immediately halt the flow of electricity to the outlet, which makes the button pop out and alerts you to the problem area. When the rectangular button on the GFI outlet is popped out, the first step is to check all of the appliances that are on the circuit. Unplug all of the appliances and turn off any major appliances before pushing the button back in on the GFI outlet. Check the breaker at the box and push it back in place if it has tripped. Slowly plug in each appliance to find which one may have caused the GFI to trip. Long extension cords can cause problems for overworked electrical circuits. If so, reduce the electric drain on other areas of the circuit or ditch the extension cord altogether and plug appliances directly into the outlets to avoid future issues and a larger drain. A GFI works hard. It monitors the electric current between the hot and neutral components. The hot component of the outlet is the circuit's ungrounded conductor, while the neutral component is the grounded conductor. The GFI is there to turn off the ground fault when there is a problem. 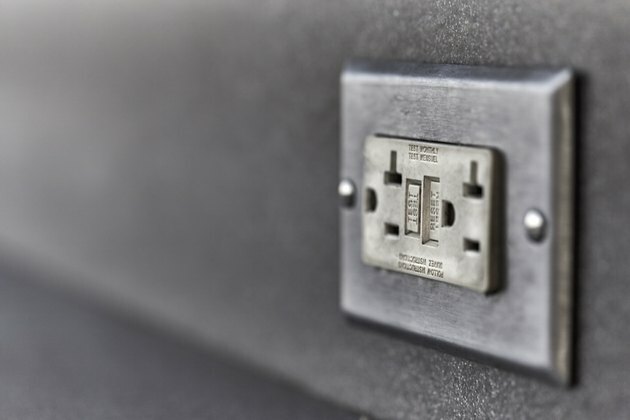 When an electrical current gets too hot, the GFI stops the current from making a connection when someone is using the outlet or plugging something into the outlet. This also saves people from electrical shocks from electricity that bleeds into surrounding areas when there is a break in the circuit. To reset GFI, simply push in the button. If it trips again, continue to investigate appliances along the circuit as well as the breaker in the box, which could be bad. The GFI outlet reset button is installed as a safety feature. It ensures that the user won't be inadvertently shocked when plugging something into the outlet or when using the appliance or other item that is plugged into the outlet. A GFI outlet that trips is actually saving the appliance that is plugged into it as well as the outlet itself from having a bigger problem. The test button on the GFI is there to allow you to make sure that specific outlet is working properly. When a GFI trips, it's due to a break in the circuit that is allowing electricity to find a way to ground elsewhere. If an appliance is the culprit, it could be that the machine has an internal short that is causing a problem at the outlet. It can also be due to worn insulation on plugs, water that has found its way into the outlet and dust or debris that has collected around the plug or outlet. A GFI is typically placed in areas that are susceptible to water and dust issues, such as bathrooms, kitchens and garages. What is Reset & Test Switches on an Electrical Outlet?